I met Kim Van Dunk in Las Vegas at the 46th Pillsbury Bake-Off contest. It was Kim’s first time as a contestant, but not her last. She also qualified for the next contest in Nashville. Now in a few weeks the next Bake-Off contest rules will be announced and I am betting Kim will go for it again. Not many people can make it to the contest two consecutive times, so it is safe to say Kim is a pretty darn good cook. Kim is also a super mom. She once worked in the corporate world of New York City but eventually left to become a teacher and a homeschooling mom to her three sons, now teenagers. In addition, Kim writes a blog, Life in the Van, where you can find her great recipes and life stories. As I was preparing to make dinner last night of a beautiful salmon, I remembered the book Kim had sent me to help rebuild The Culinary Cellar after the flood. 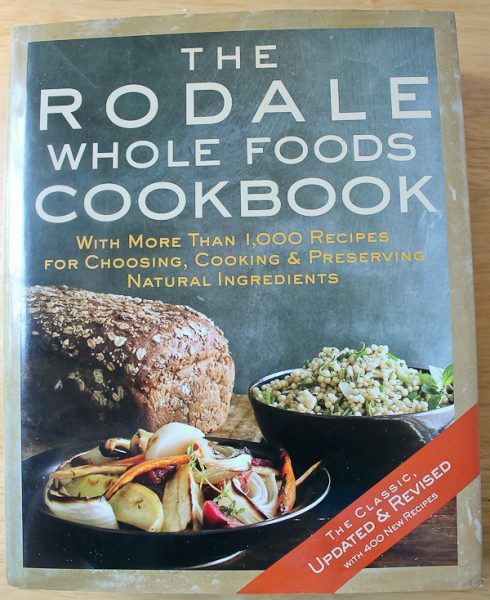 It was a huge beautiful book, The Rodale Whole Foods Cookbook. I thought there would probably be some interesting seafood recipes in the book, and sure enough I found one. It was easy and so good. “Spicy Baked Salmon” would be dinner. I added some asparagus that I roasted right alongside the salmon. 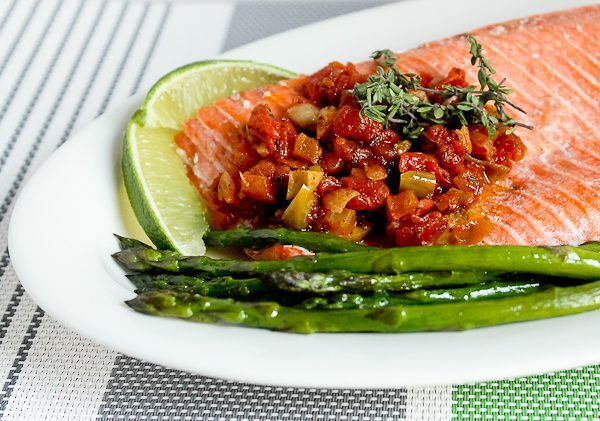 The aromatic and spicy sauce has to be made first as it needs to simmer for about a half hour to develop its assertive flavors, but then it only takes about 15 minutes to bake the salmon. The sauce is made by first sautéing onions and garlic in olive oil, then stirring in some chili powder. Added next is a can of spicy diced tomatoes (like Rotel) a chopped pickled jalapeno pepper, chopped green olives, and spices including oregano, thyme, and cinnamon. The combination is bold and spicy, perfect for the meaty and rich salmon which is sprinkled with lime juice. Lots of flavor in this dish! This cookbook contains more than 1,000 recipes in addition to pages and pages packed with nutritional information for healthy cooking, purchasing foods, storing foods, food safety, and even tips on choosing cookware. The recipes showcase the versatility of wholesome whole grains, natural sweeteners, seasonal fruits and vegetables, and other fresh unprocessed foods. Thank you, Kim, for this great book, one that I know I will be referring to for many meal ideas. The spicy sauce is going to be one of my staples now. There was some sauce left over and it’s going to find a way into my next omelet this weekend. In a large skillet, heat the olive oil over medium heat. Add the onions and garlic; cook until soft, about 5 minutes. Add the chili powder, stirring to coat. Add the tomatoes, jalapeno, olives, oregano, thyme, cinnamon, salt, and water. Bring to boil, then reduce to a simmer. Cover and cook for 30 minutes, or until the sauce is richly flavored. Sprinkle the salmon with the lime juice and place in a 9-by-13-inch baking dish. Spoon ¾ of the sauce over the fish. Bake for about 15-20 minutes or until the salmon just flakes when tested with a fork. Reheat the remaining sauce and spoon over the fish before serving. Makes 4 servings. So glad to be a small part of your new Culinary Cellar, Debbie. I’m also going to have to try this recipe because it sounds (and looks) delicious! It was so good, Kim! I love spicy and flavorful and this was both. I loved the touch of cinnamon in the savory topping. Thank you again for this wonderful book! Salmon is a favorite at our house. How I would love to pull up a chair at your dinner table! Your photo is beautifully done. Yum! The spicy salsa sounds like a delicious addition to all sorts of dishes. Can’t wait to try it. You get the best salmon in the country where you live! I think you would love this topping, and you’re right that it would be great with many other proteins. The topping makes a delicious addition to a cheese omelet. I made one this morning! Yes, we do! It will be fun to try it with a variety of the fresh fish that we enjoy here in the NW and I like your idea of having it over an omelet, too. Thanks for sharing. I’m going to be copying this recipe too! It was so nice of Kim to send you such a lovely cookbook! I bet there many more wonderful recipes inside!!!!!!! So many good recipes, Ronna! The book now has at least a dozen post-it stickers marking pages of ones I am going to try.